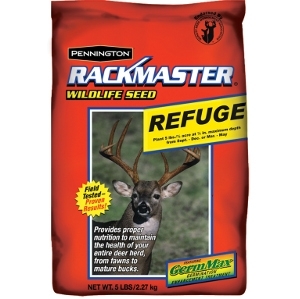 Rackmaster® Refuge is a fall and spring planted seed mixture of annual greens, perennial clover and chicory that will provide an abundant high protein diet for deer, turkey and other wildlife. Refuge mixture is an easy to plant mixture that will thrive on most any soil type for years to come. Refuge makes an ideal food plot that will germinate quickly to provide immediate high protein food supplies to fill the nutritional gaps found in nature. With fast germination and immediate forage production, your plots will start feeding wildlife days after germination and continue feeding throughout the fall, winter, spring and summer months because of the staggered growth habits of the different plants in this mixture.